Are Landlords Running A Business, or Are They Just Investors? To be honest, I didn’t think about my properties as a business at first, and it wasn’t until I started to talk to and listen to more experienced investors, that I then started to change my approach to the whole thing. 1. Owning a buy to let is simply just investing, and the rent received is a return on that investment, similar to stocks and shares. Although that maybe true, you have to remember that landlords have a customer who needs must be met and who’s problems ‘with the property’, must be addressed. 2. The governments introduction of Section 24 would suggest that the government doesn’t classify private landlords as a business, as business’s are usually entitled to offset 100% of their borrowing costs against their turnover for the calculation of tax. Ok, fair comment, but lets look at this more closely because individuals who invest through a company, are not liable to Section 24. So 2 investors buy houses as an investment next door to each other. One investor buys the property in their own name, and the other investor buys through a Limited company. Does that mean that one is running a business and the other isn’t? Of course not. This is simply the difference between owning a company and trading in your own name. A piece of paper can determine if it’s a Company, but not necessarily whether it’s a business or not. Source dictionary.com – Point 3. a person, partnership, or corporation engaged in commerce, manufacturing, or a service; profit-seeking enterprise or concern. 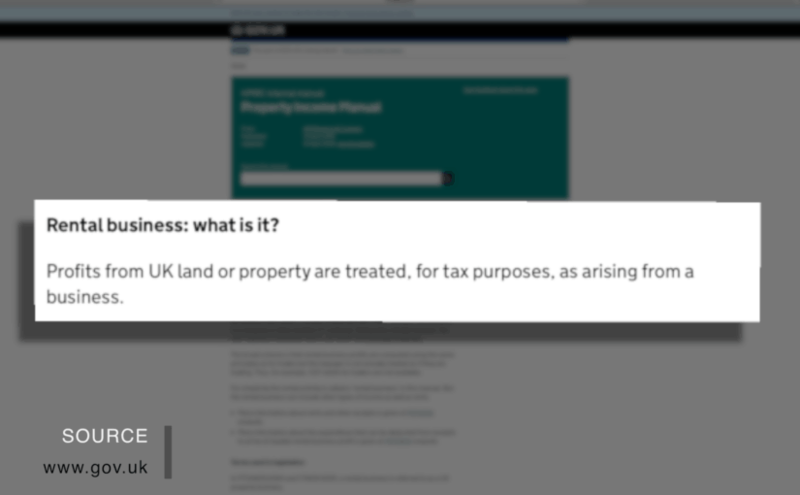 Also, the HMRC website states that Profits from UK land or property are treated, for tax purposes, as arising from a business. I believe that when you start to approach property investing as a business, and not just as an investment, you will do better and there is a greater chance of your portfolio improving and growing over time. 1. You start to take control of your own destiny. You get to make decisions and direct something in the way you think is best. Not every decision will be right, but we can only learn and improve by our mistakes. If you don’t make any mistakes, you’ll never change or improve. But the point I want to make here, is that you will start to control your own destiny. 2. You become an entrepreneur. And I believe, we all have an entrepreneurial streak within us. The text book definition is someone who organises a business and assumes the risk for it. On the flip side of that, you reap all the rewards, not your employer! As you know, there is some risk with property investing, BUT, with a small amount of the right knowledge, you can reduce that risk significantly. Some people enjoy the routine of a job and performing the same tasks day after day, as an entrepreneur, you learn and create new opportunities for yourself. 3. You can start to plan your own work life balance. It’s a step in the right direction to not being solely dependant on an employer. As your business grows, you can set your own hours and work from wherever you want and wear what ever you want. 4. You choose the people you work with. Now initially it will probably just be the people you hire to provide a service, like a letting agent. But unlike being an employee, if you don’t like your co-workers, it’s easy to replace them. 5. You can give back to your community. Many entrepreneurs like the idea of being able to give back, whether it’s in the form of a product, a service they offer, creating jobs or donating to charities. Plus there’s a lot of satisfaction in solving a problem for someone, and providing someone with a nice home, is a good problem to solve. 6. You Feel Pride In Building Something of Your Own. There is nothing like being successful through your own abilities, ideas and efforts. So to finish, I recommend that if your new to property investing, you should approach it as a business from day one, if your already landlord, start thinking like a business owner now, if you’re not already. Are you a landlord? Do you agree with my comments or do you have anything to add? Please leave a comment below as I would appreciate your thoughts on this.